Jimmy Davis was born on March 6, 1930 here on “the Island.” The only time he ever left was when he was in the service. 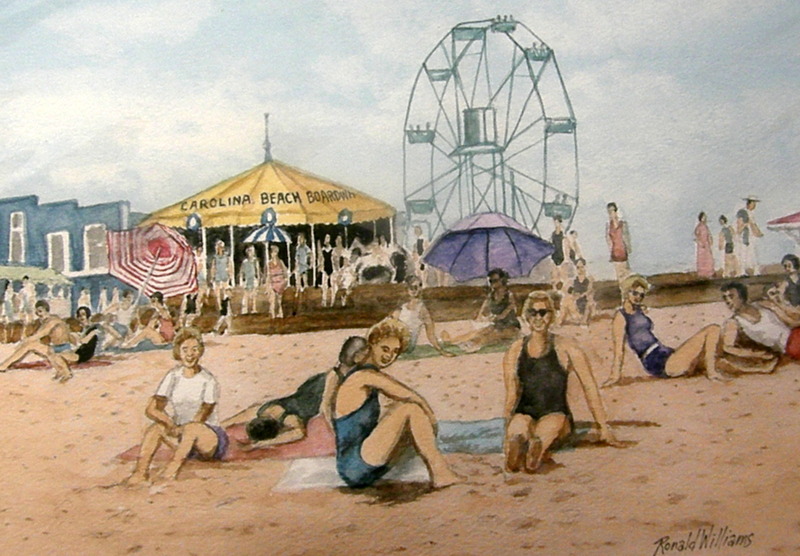 His most vivid childhood memories are of the boardwalk. 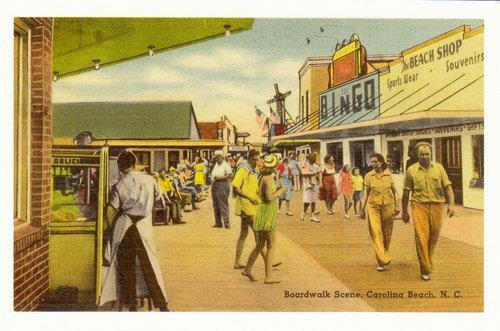 “The way I remember the boardwalk was like I said, in the early years, I’d say ‘38 or ‘39, there was a big pavilion and they had dances upstairs and on Sunday afternoon they would have a matinee with the guys that were just coming along starting the bands. And they’d play for maybe two hours up there. 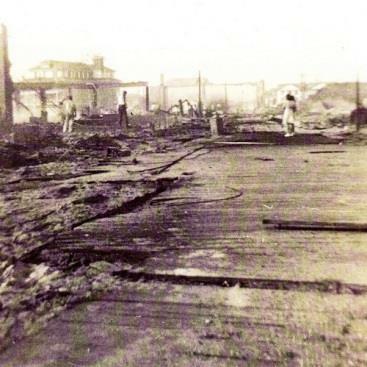 “Me and my mother walked up almost to the boardwalk there the morning of the fire and watched the beach crowd. “Naturally when they dropped it it was gone under that boardwalk. A lot of them always said they used chewing gum on the end of a stick. But I never did. I had a little stick about like this, and round, and I split the end of it about an inch up. I’d take the back side of the stick and stand that penny or dime or 50 cent whatever it was -stand it up – and turn your stick around and go right down on that split and pull it right up. See you couldn’t get it out. His grandfather came to Carolina Beach from Brunswick County and his mother from Rowan County. 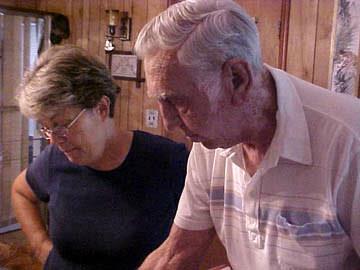 His maternal grandparents were Ludwigs. This month we recorded 40 members and guests at our June Potluck. The History Center recorded 94 visitors! The gift shop took in $99.44 The History Center was used by Got-‘em-on Live, the Fort Fisher UDC and The Pleasure Island Sea Turtle Project. Rebecca spoke to a summer UNCW education class about the history of Federal Point. Please welcome new members Dennis Kabasko and Erick Merriman of Carolina Beach and Nancy Cameron McGwier also of Carolina Beach. Thanks to Sylvia Snook, Ron Griffin and Demetria Sapienza for keeping the History Center open while Rebecca was on vacation! Thanks to our History Center Volunteers Carl Filipiak and Ron Griffin for working on the cataloging of the subject files. That project is finally beginning to move ahead. The Wilmington Salt Works began operations in 1861 in response to severe salt shortages. 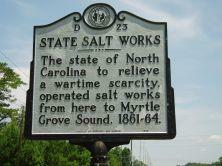 Early in the Civil War the Union Army destroyed salt works in Currituck County and later near Morehead City. The Wilmington works was the only operation able to continue salt-making until Union forces destroyed it in April 1864. The Cape Fear Museum interprets salt-making as part of a section on the Wilmington Salt Works in its Civil War exhibit. A new company, Carolina Salt Works, is now operating in Shallotte, only about 35 miles southwest of Wilmington near the South Carolina border. 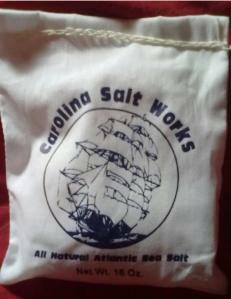 According to the back of the product package (the cotton sack shown above) Carolina Salt Works gathers seawater during the full moon and produces the salt as a residue of natural evaporation. This process is much like the salt-making on the North Carolina coast during the Civil War. 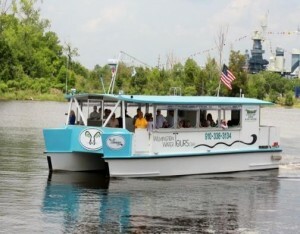 budget year; serving the general public, including both locals and visitors. Nominations: We hold our annual election at the July meeting. The Nominating Committee has proposed the following slate. Members are welcome to make other nominations from the floor at the meeting. The Federal Point Historic Preservation Society will hold its monthly meeting on Monday, July 17. 7:30 pm at the Federal Point History Center, 1121-A North Lake Park Blvd., adjacent to Carolina Beach Town Hall. Our July speaker will be Nicole Tumbleson Morris. She will update us on the current work begin done by the Underwater Archaeology Branch (UAB), as they began final recovery efforts of the remains of Blackbeard’s legendary flagship. 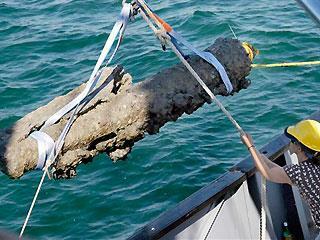 The team has uncovered incredible artifacts from cannons, anchors and ammunition to the remains of the ship herself hidden in a watery grave for almost 300 years. Each relic from the past breathes new life into the true story of Blackbeard’s reign as history’s most legendary pirate. Ms. Morris is currently involved in creating a seven part educational web series which will take audiences along for every step of this thrilling adventure. designed to be robust and relevant, providing real world archaeological experiences to reflect the knowledge and skills our young people need for success in college and careers. Students and teachers alike will be able to experience the thrill of discovery as they follow along with our web series and learn about archaeology, conservation, history and of course, pirates! Ms. Morris is a Maritime Archaeologist currently working for South Eastern Archaeological Services, Inc. as the Project Director and Educational Coordinator. She received a BA in History and Anthropology from the University of Florida and a MA in Anthropology (Maritime Archaeology) from the University of West Florida. Since 2002, she has participated in field research projects on 16th-century Spanish ships, Civil War blockade-runners and blockade vessels and numerous 19th-century ship loss sites. 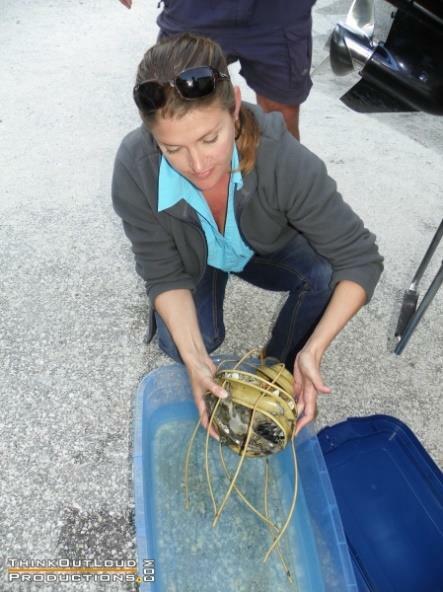 She is currently the Project Director for the Tampa Bay Historical Shipwreck Survey, which resulted in the nomination of Florida’s 12th Underwater Archaeological Preserve. She is also a certified dive instructor who teaches vocational archaeological dive classes that allow divers to participate in ongoing archaeological field research.